NGC 3193 is very bright, round with a stellar nucleus. NGC 3190 is elongated, lens shape with a brighter more concentrated middle. NGC 3187 at 13.1 magnitude is the faintest and most difficult of the group. When observed with the 10-inch, averted vision is required. It appears as little more than a faint glow, requiring an excellent night just to glimpse. I have never been able to hold this faint galaxy constantly, even with averted vision. On many nights, I am unable to see this galaxy. 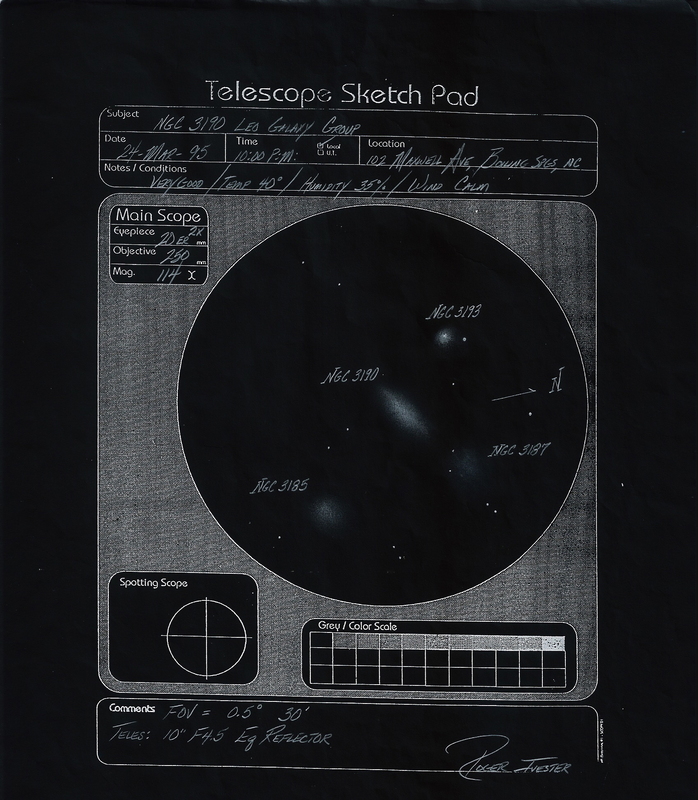 NGC 3185 at magnitude 12.2 appears very faint and diffuse with a slight elongated halo. The surface brightness is very low, and a brighter more concentrated middle was noted. This entry was posted on April 10, 2011 at 12:55 am and is filed under Work File Only - Observer's Challenge Reports. You can subscribe via RSS 2.0 feed to this post's comments. Both comments and pings are currently closed.